Remember the heroine's father in My Big Fat Greek Wedding whose solution to all problems was a spritz of Windex? There actually is an everyday household product with incredible multitasking properties. The humble box of baking soda can be put to a number of amazing uses. 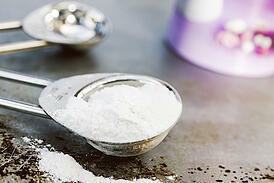 Here are 10 ways baking soda can help around your Springs Apartments home. How many household products can you replace with this one simple item? 1. Brush your teeth with a paste made from baking soda and water for a natural alternative to regular toothpaste. Its mild abrasiveness cleans while it shines. 2. Replace another chemical-laden grooming accessory by using a dusting of baking soda under your arms for deodorant. 3. Hair can wilt under repeated applications of the best products. Cut through the build-up by adding a teaspoon of baking soda to your shampoo. 4. Give yourself a DIY spa treatment by applying a mix of three parts baking soda and one part water to your face. Use a circular motion to massage gently, avoiding the delicate eye area. Rinse with clear water. The baking soda provides a mild exfoliating effect, leaving your skin soft and glowing. 5. Did your latest session of furniture rearranging leave scuff marks on the wall? Maybe the kids decided to create some crayon art. Gently rub the stains with a 50/50 mix of water and baking soda. Wipe away and the marks will be magically gone. 6. Deal with a clogged drain without using harsh, caustic chemicals. Pour 1/2 cup to one cup of baking soda down the drain. Follow up by slowly pouring the same amount of white vinegar. Cover the drain and let it sit for five minutes, then flush with one gallon of boiling water. 7. Clean out a coffee maker by adding baking soda and running it through a cycle. 8. If you suffer from heartburn or a sour stomach, 1/2 teaspoon of baking soda dissolved in 1/2 cup of water makes an effective antacid. 9. Avoid time-consuming scrubbing of baked-on residue coating casseroles, pots and pans. Sprinkle baking soda over them, then add dish detergent and hot water. After 15 minutes, wash as usual. 10. Baking soda can act as a dry shampoo for carpets, removing odors and leaving them fresh-smelling. Sprinkle a box over your carpet and let it sit for 30 minutes, overnight if possible, then vacuum. Have you replaced any other household products with a more eco-friendly and cost-effective substitute? Share your ideas in the comments!